a.k.a. - Inginocchiati straniero... I cadaveri non fanno ombra! Lazar (Jack Betts) is a bounty killer, the best in the business, but he is being watched and followed across the Old West by another mysterious stranger who has an equally fast draw. In persuit of a valuable bounty, Betts arrives in a small Mexican mining town, run by the oppressive Barret (Ettore Manni) but the stranger is not far behind. As usual, as well as directing and producing, Fidani proves the script for Dead Men Don't Make Shadows and as has come to typify his output, the script is very basic and cliché with only the barest skeleton of a storyline - this means that the pacing is very slow throughout and there is little to no characterisation at all. The opening scenes with the mysterious stranger do provide a degree of mystery but there is not enough going on in the film to keep this interest and it drags along to a none too impressive finalé with a number of all too predicatable genre clichés along the way - certainly a film that would not have been harmed by being cut down considerably in editing. Behind the camera, Fidani works with cinematographer Aristide Massaccesi (aka Joe D'Amato) in one of his earliest productions, to give the film some inovative angles and shots that help to keep things moving. The early scenes in the film make good use of the recognisable standing sets from other films, but the Mexican town and particularly the mine show up the small budget - fortunately the location shoots look a little more authentic than the obvious quarries used in some of Fidani's other pictures. The music consists of a couple of themes repeatedly re-used and sometimes inappropriate but generally helping to build the genre feel. Jack Betts, credited as Hunt Powers, was an American television actor who had a run of Spaghetti Western films in the late 1960s after appearing in Sugar Colt (1966). He plays the genre typical, black clad, strong silent type bounty hunter and as such gets very little to do in acting terms but provides a solid performance. Two former Peplum stars have supporting roles, Gordon Mitchell (L'ira di Achille (1962)) gets little more than a cameo as one of Lazar's victims while Ettore Manni (Roma contro Roma (1964)) gets rather more to do as Barret but sadly the role is too poorly developed to let him do any real acting. 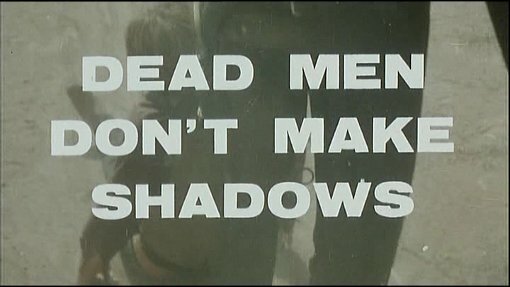 Dead Men Don't Make Shadows is not a good film in anybody's books - the pacing is terribly slow and the script simply does not provide enough storyline to allow the cast to do anything interesting. Fortunately Joe D'Amato does some good work with the camera that at least keeps things watchable. Of interest to genre fans as an example of the slew of low budget films that emerged to capitalise on the success of the Spaghetti Westerns but not otherwise recommendable. Anyone else involved? Joe D'Amato (credited under his real name of Aristide Massaccesi) is the cinematographer - he would later become a successful director, responsible for the Laura Gemser Black Emanuelle series. Who is it for? Of interest to genre fans as an example of the low budget exploitation Spaghetti Westerns. Visuals Aspect ratio 1.85:1 anamorphic wide-screen. Colour. Picture quality is very impressive with good colours and detail throughout. Trailer - with an English voice over. Fullscreen, VHS sourced. An 11 image gallery of press-book, promotional images, lobby cards and video covers for the film under various international titles. As a video file with music and chapter stop scrollable. Additional features are included on the disc for the other included film Django e Sartana. Availability Only available as a double-feature with Django e Sartana. Other regions? Previously released by Global Video, South Africa with English audio. Cuts? Cut status unknown - no obvious cuts. Titles and credits are in English. Some impressive direction from a young Joe D'Amato is undermined by a poor script and horrifically slow pacing. Picture and audio are very impressive and the interview piece is well worth watching with a lot of interesting stories. See our reviews of more Spaghetti Westerns. All text in this review written by Timothy Young - 15th March 2010.